I once spent a month living in a hammock on a beach. Best. Summer. Vacation. Ever. However, the one major drawback was that I didn’t have a tarp. It meant that I had to sleep through enough wet nights that a vowed never to do it again without a rain fly. I’ve compiled this list to help others avoid my mistakes. I’ve included a bunch of budget options in here as a homage to my beach experience. But in my option, the best hammock tarps are rarely the cheapest, and you only get the reliability and durability you want when you spend a few extra dollars. Great coverage & extremely durable! The Hennessy Hammock Tarp is a great bit of kit that offers a good balance of pretty much everything you want: good coverage, very durable, compact when folded, not heavy and not expensive. You can pitch it so that the sides almost touch the ground, which obviously makes it very effective at blocking the wind. And it’s got some pretty awesome pockets for the ropes! (It comes with guylines and a carry sack). The attachment points are tie-outs not grommets, making it more difficult to use with walking poles. It is big, and this means that there are lighter tarps on the market if you’re the sort of person who really watches the ounces. And It doesn’t come with stakes. If you are a real lightweight gear junkie you might prefer the Chill Gorilla tarp (which is 2oz lighter). And if you are on a budget, the Roman Ventures hammock rain fly might be more up your street. But if you’re looking for a great all-rounder that’s gonna last you a loo-oong time, the Hennessy will not disappoint! The Chill Gorilla 10’ by 10’ hammock tarp is a versatile tarp that can be set up in several different ways with its wide square overall shape. It uses tough 210D Ripstop nylon and a total of 9 attachment points which can withstand mild wind and rainstorms on the fly. It is very lightweight for it’s overall unpacked size and is easy to set up. Although the materials are extremely tough, you may need to tape the centerline seams to truly keep any rain out. Some of the stitching on the corner seams may pull loose if you tighten the attachment cords too tight. Overall this tarp may be a great choice if you are hiking, camping or hunting in the wilderness for short amounts of time. If you don’t mind adding a little extra rainproof tape to the seams, this tarp will hold water out longer during storms. The Roman Ventures Hammock Rainfly is a great choice for those needing a simple and lightweight hammock tarp that they can depend on for short hikes and relaxation. The materials are made of high-quality Ripstop nylon to prevent tears with a waterproof taped middle seam. This hammock tarp will offer a great amount of shelter from the elements but the curved shape of the sides of the tarp may not offer as much shelter from the wind. It is only offered in a lime green color which may put you off if you’d prefer to not stand out. Overall this tarp is a wonderful choice for fair weather hiking enthusiasts or backyard hammock dwellers who enjoy reading a book under the comfort of a quality hammock. Unpacked size: 10'6" x 6'4"
It offers a solid amount of protection from rain and sun while allowing you to relax with privacy in your hammock. It has 6 attachment points that offer a sturdy and stable shelter. Its extremely light and compact setup makes it great for hiking long distances and setting up for the night. This tarp is not spacious enough to cover down very far, so you must pitch it low to the ground. If not positioned in heavy cover, you may experience wind coming in through the ends. This hammock tarp makes an excellent choice for hammock base campers, backpacking through heavily wooded areas with hammocks or even festival hammock camping. It is designed mainly for hammocks. The Outdoors Way Camping Hammock Rain Fly is an excellent choice for basic backyard or wilderness relaxation. The strong and durable corner loops that the ropes run through allow it to withstand an occasional light rain. It’s diamond shape and dark grey color will shield your eyes well from the sun. The 4 attachment points limit the number of configurations. It only comes with two ropes. And you may need to purchase separate ground stakes since the ones provided tend to be sharp enough to cut through the support ropes. If relaxing out in the quiet woods, out for a picnic or in the backyard hammocking, you may really enjoy this tarp. It offers basic protection from rain but may not be suitable for use during windy conditions. This 10ft by 10ft rain tarp shelter serves well as a spacious and versatile hammock tarp or shelter for your outdoor needs. The tough 210T Dacron material with a taped center seam will keep you dry under rainstorms and stretches low enough to the ground to shield you from the wind. The 8 different attachment points ensure that your tarp will stay secure and allow you to set this tarp up for almost any type of situation. Although the materials are excellent, you may need to purchase separate cordage to add more strength to the overall attachment areas. The corner loops don’t have grommets which may cause them to tear. If you are a hunter or wilderness expeditionist, you may really enjoy this hammock tarp. It offers a great deal of wind and rain protection out of the bag. With more improvements made to the corner loops and cordage, you will have an exceptionally sturdy, versatile and lightweight hammock tent for any of your needs. The extremely affordable Hammock Rain Fly by Krazy Outdoors is very easy and quick to set up with its 4 attachment cords and lightweight design. The basic 70D Ripstop nylon material offers decent rain coverage that can cover a wide area, making it a good for a backup rainfly or simple hammock tarp. Although it’s lightweight and does prevent mild amounts of rain, it may not be sturdy enough to withstand a heavy storm with its basic 4 attachment points. With only two tie-outs to the side, there’s a good chance of rain coming in around the edges. This hammock tarp is great if you are on a budget and only plan on using it in calm conditions. It’s nice a simple (which can go both ways, depending on how heavy you are into pitching tarps…). But definitely does the job. A hammock and tarp may be used by hunters who have free roam of a hunting reservation that stretches for miles, allowing them to quickly choose an area to make camp so they can relax and get something to eat. Likewise, backpackers or hikers may also be able to choose a rest area or scenic spot to take in the sights without the sun or rain beating down on them. The lightweight and easy setup of hammock and tarps make them an excellent choice for outdoor activities of all kinds that require a simple shelter. It’s basically the opposite of going camping with a large tent. What to consider when buying a hammock tarp? 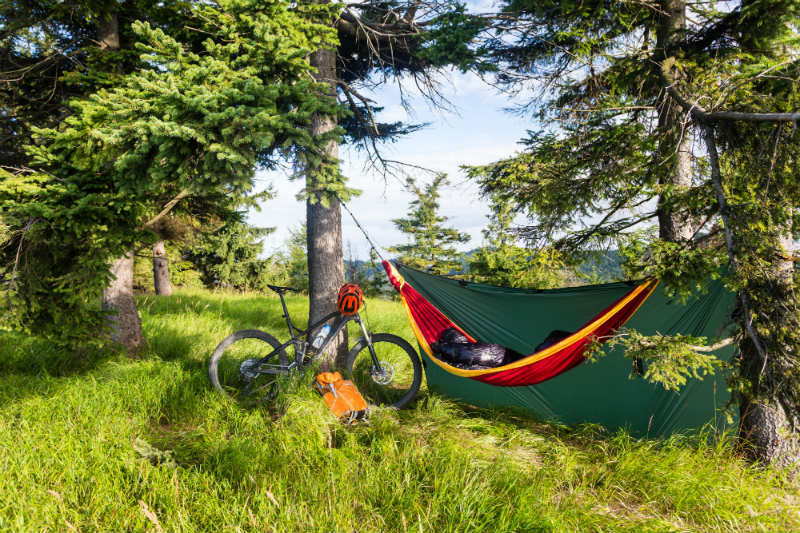 Before purchasing a hammock tarp, there are several qualities you should consider to choose the right tarp for your needs. A possible concern for someone purchasing hammock tarps is the number of attachment points. More attachment points will take more time to set up but will often be sturdier. You will also get a pretty general idea of how the tarp is anchored down by the type of tightening mechanisms the ropes have. A hammock tarp that is made of durable materials will be less likely to tear or come untied and will provide a waterproof roof for your hammock. The features of a hammock tarp that require excellent quality are the rainfly, attachment ropes, stakes, and seams. If any of these parts were to break or fail, the shelter over your hammock may be rendered unusable, requiring you to make quick fixes or adjustments to your setup or completely end your trip early. It’s best to avoid possible manufacturer flaws and go for a tarp that is well made. You will most likely want a hammock tarp that is lightweight, especially if you are carrying gear for long distances. When combined with your hammock and other gear, the tarp itself can make the load even heavier. Although a lighter tarp may be better for reducing your carrying weight, you may expect a heavier weight to be a sign of higher quality materials. 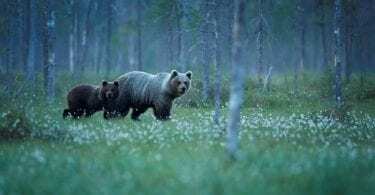 This aspect of the tarp may be completely up to your personal preferences, what you’re willing to carry versus how much guaranteed protection you want. The packed size can also be an important aspect of the tarp if you are hiking. Combined with all your other gear, you won’t want a bulky bag that swings around much on your pack or something that requires you to carry by hand. Hammock tarps may seem pretty similar in size while they are packed away, but even a few inches can make all the difference. Closely consider what other gear you will have on your pack and how you would make space for the packed tarp.